This week, the world is saying goodbye to one of the most gifted scientists the world has ever seen: Professor Stephen Hawking. Famous for his work as a physicist and cosmologist, Stephen Hawking lived with motor neurone disease for over 50 years. Everybody's talking about it – and BBC Learning English presenter Charlene's been finding out the actual words they've been saying. Hi everyone! I'm Charlene from BBC Learning English. This week, the world said goodbye to one of the most gifted scientists the world has ever seen: Professor Stephen Hawking. Famous for his work as a physicist and cosmologist, Stephen Hawking lived with motor neurone disease for over 50 years. Everybody's talking about it, and I'm asking three questions to find out the actual words people are saying. Question one. What does the name Professor Stephen Hawking mean to you? It means no boundaries, no limits, to infinity and beyond – literally, you know? So, I know that he's an astrophysicist. He studied in Cambridge and he… there was a movie that was made about him and he studied, I think, the origin of the universe. That's pretty much all I know about him. I think about his book, A Brief History of Time, and I think about the movie that he was in. And The Simpsons. I'm not gonna lie - I don't really know much about him. I know very little, unfortunately. What do I know about his work? Well, he talks about the big bang theory, and how the universe is expanding, and one day there will be a big crunch and it'll stop expanding. What do you think he will be most remembered for? I think he's gonna be a great source of inspiration for many people. For the ability to prevail, to go beyond boundaries and to believe in himself. So, there you go. 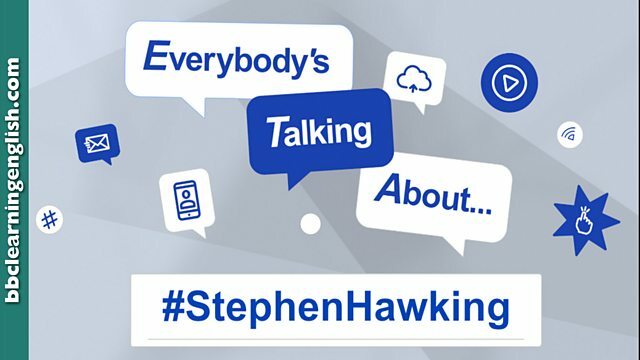 Everybody's talking about #StephenHawking and now you can too! There's a quick recap coming up in just a second – but don't forget you can find out more about this topic at BBC Learning English dot com. You can also find us on Facebook, Twitter, Instagram and YouTube - and get talking! See you next time! Try this quiz to see whether you're ready to talk about today's trending topic. Answer these questions to see how well you've picked up today's language. There's a short form in this phrase! Choose the fixed phrase from today's programme that has a similar meaning to 'To be honest'. Think about base and strong adjectives. Which phrase CANNOT fill the gap in this sentence? "It's ______ hard for me to answer." This is a two-word phrase. Which phrase means 'almost' or 'more or less' and fits in this gap? "That's ______ all I know about him." Which word from today's programme means 'succeed in spite of difficulties'? It means no boundaries; no limits; to infinity and beyond – literally, you know? That's pretty much all I know about him. What does the name Professor Stephen Hawking mean to you? What do you know about his work? What do you think he will be most remembered for? Send your comment to us by email. Please write '#StephenHawking' in the subject line. We'll publish our favourite emails here on this page. We can't reply to individual comments, but we do read all of them! Hello, BBC learning English. I'm Leon and I'm from China. I'm preparing THE IELTS and learning English from this website. Ok,let's talk about the activities. What does the name Professor Stephen Hawking mean to you? Well, for us Chinese students, when we were in primary school, our textbooks tell us Hawking as a great scientist from then we know him and later we know his book 'A brief history of time'. When I went to university my friends told me a movie about Hawking has released. This year, I'm in the third year of college,when I heard the news I was shocked, but immediatly I recovered,because we just heard his name on the book,newspaper, movies, television, but we never going to know him, but still I felt we already lost someone important. That day when Stephen passed, my friends say he's gone and we lost a human star now we can just look up and stare the star. As for what he would be most remembered, I think his theories and his sprite. He already became a model of perseverance in Chinese mind. I wish I can be a person who have great contribution in Human history. Thank you for reading this BBC learning English team and thank you for building such a helping website. The name professor Hawking means no boundaries for his ability to prevail against life threatening disease and his inexorable curious to know more it has rewarded him joyfully with success which it has given the world the cause to rejoice over this discovery. What do I know about his work? well I'm not going to lie- I don't know much about his work but I once listened him on bbc reith lectures. I think he is going to be an infinite paragon of many generation for his great discovery. Stephen Hawking means the kind of person whose genius is completely out of my reach because I can’t ven imagine learning the ropes of all those theories that explain how the Universe and our lives are ruled over. I think he’s worthy of admiration because he has put a great deal of effort on what he believed. For me his name mean never surrender despite the life circumstances. For example he lived with a disease for near of 50 years and he achieved to destacaded in the science field despite of his illness. talking about his work he wrote several books related with the time, the big bang and hole blacks and I think that he will be remembered for your thinks about God and the reasons that he had to never belive in a the supreme being. When I think about Professor Stephen Hawking I think about the movie where the Professor was in. Beyond to his way to be genius, a strong his aspect remained to me is his great willpower, demonstrated in continuing the studies, in living and loving how a person normal do, in spite his bad health conditions. About his work I know very little and I never read his books, but I know he dealed with the theory of the relativity. To finish, my personal view is that he will be rememered for his theories by scientists, phisicists and cosmologists, while for common people he will be remain for ever a great example of how to overtake hostilities in life. I really don't understand why he's never received the Nobel Prize . He deserved it no doubt about that and without considering his illness. Cosmology is probably not a 'glamour' enough field of Physic. But talented as he was his work won't disappear in a black hole! Thank you for emailing your comments to us. We enjoyed reading them. This task is now closed.